Tranquility and elegance of the Hotel Amarante Beau Manor, located just a few yards from the Faubourg Saint Honor. The Amarante Beau Manoir is a deluxe hotel located in the heart of Paris and 20 km from Charles de Gaulle International Airport. The hotel has a unique charming style of an elegant country manor. You will enjoy your best memories from Paris in the famous Maxim's and Fauchon area. The hotel features guest rooms decorated with shimmering textiles, walnut- wood furniture, marble bathrooms and a refined salon with period furniture. Even though this hotel opened in 1994, it has the feel of a 19th century manor house. The lobby is like a private living room, with walnut reproductions of 18th and 19th century antiques, Aubusson tapestries and fresh flowers. The guest rooms are charming, comfortable and well appointed and range is size from cozy to very spacious. All of the rooms are completely soundproofed and are very secure. All of the guest rooms are air conditioned. The Amarante Beau Manoir is convenient to many area shopping, dining and entertainment venues. * Parking - Comp. ;Limited * Pets Allowed * Elevators Fine cuisine The Amarante Beau Manoir offers you two different breakfasts, served from 7 to 11 am. * Continental breakfast, served in a dining room or in your room. * Continental breakfast, served in a dining room or in your room. Additional services The Hotel Amarante Beau Manoir has a bar and offers its guests: * Room service * Restaurant service open 11 am to 3 p. m. and 7 to 11 p. m., with a full menu. * A fitness room * A room for seminars of up to 15 people and option of catering. Guest rooms are tastefully decorated in a pleasing blend of shimmering textiles, walnut furniture and marble bathrooms. 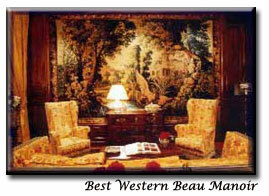 The four-star Amarante Beau Manoir has 60 standard and superior guest rooms and suites on five floors. Some are connecting rooms to facilitate the lodging of families. The decoration is sober, with walls covered in a beautiful solid cloth, and wall hangings by the Masters. The soft lighting casts a natural and relaxing sweetness on the atmosphere. The ceilings have wooden beams and blend beautifully with the walnut furniture. A thick lush carpeting covers the floor and makes our rooms even more comfortable for our guests. Located near the Madeleine, which is surrounded by a charming flower market and gourmet shops (Fauchon), the Hotel Amarante Beau Manoir enjoys an exceptional location in the heart of the prestigious, luxurious and artistic part of Paris. Champs Elysees, the Place de la Concorde, the great museums and most beautiful monuments on both sides of the Seine are only yards away. Nearby you will also find the Opera Garnier, large boulevards with boutiques, cafes, theaters, and other entertainment centers. Minutes from the hotel is the Place Vendôme and the Rue de la Paix, famous for its jewelers, followed by the Faubourg Saint Honor and the Rue Royale, where there are elegant boutiques. With its wide tree-lined walks, small wooded areas, ponds and fountains and its vantage point between the Louvre and the Champs Elysees, the garden Jardín des Tuileries offers a thankful and peaceful break after a day of sightseeing or shopping. 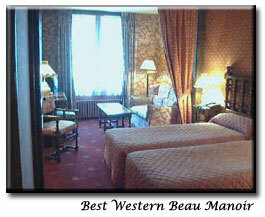 The Best Western Beau Manoir Hotel is located city centre, in the best area of Paris. Near to Madeleine, Opera Square, Concorde Place, and Champs Elysees.